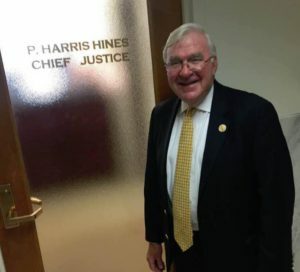 In the days following former Georgia Supreme Court Chief Justice Harris Hines’ death on Nov. 4, he has been praised for his judicial acumen, fairness and kindness. The Georgia First Amendment Foundation remembers him as a friend of our organization and our cause. Hines, who had just retired from the bench in August, was a regular at our annual Weltner Award Banquet. He introduced past honoree Sam Olens, and, in October, appeared in a video tribute to the openness and transparency of this year’s honoree, Cobb Superior Court Senior Judge James Bodiford. Hines himself was a Cobb County Superior Court judge in the early 1990s when the Marietta Daily Journal filed a lawsuit against Promina Health System and Northwest Georgia Health System seeking an injunction requiring the defendants to comply with Georgia’s Sunshine Laws. Hines ruled in favor of the Journal, setting a precedent of public access to records of a private, nonprofit hospital doing work on behalf of a governmental hospital authority. The Georgia Court of Appeals affirmed his ruling in 1995. As a Supreme Court justice, Hines wrote the Court’s unanimous opinion in Howard v. Sumter Free Press, which compelled the Sumter County Sheriff’s Office to comply with the Open Records Act. The opinion rejected an allegation that the newspaper’s records requests were not bona fide because they were made verbally. Earlier this year, in Tucker v. Atwater, Hines joined justices Keith Blackwell and Nels Peterson in questioning whether Tift County school officials had gone too far in punishing a teacher for comments made on her private Facebook account. Hines, 75, was killed in a car accident on I-85 en route to his home in Marietta from Newnan, where he had heard his granddaughter sing in a church choir. His memorial service at 2 p.m. on Nov. 13 will be broadcast live from First Presbyterian Church of Marietta.